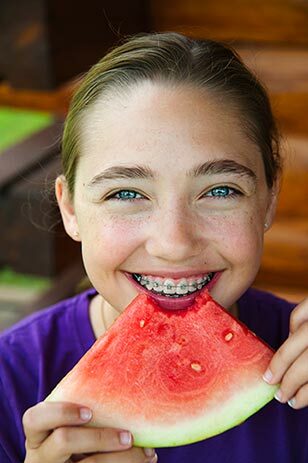 What Can I Eat If I Am Wearing Braces? The following substances will cause damage to the braces and should absolutely not be eaten: candy apples, caramels, hard and sticky candy, candy bars, aquarium gravel, gum balls, jaw breakers, chicklets, or other gum, popcorn, bones, nuts, ice, chips, chewable vitamins, or any other crunchy or sticky items. Foods such as apples, carrots, celery, pretzels, French bread, bagels, waffles, and meats should be cut into small pieces and chewed with your back teeth. Keep pencils, fingernails, straws, etc. out of your mouth. Please realize that the use of sugar-containing candy, soda, gum, etc. also promotes tooth decay. If a bracket falls off, the wire bends or anything else breaks or becomes loose, the patient needs to call right away so that an appointment may be made for the appropriate length of time (generally 30-45 minutes) that we need in order to make the repair. This is especially important even if the patient already has an appointment scheduled. 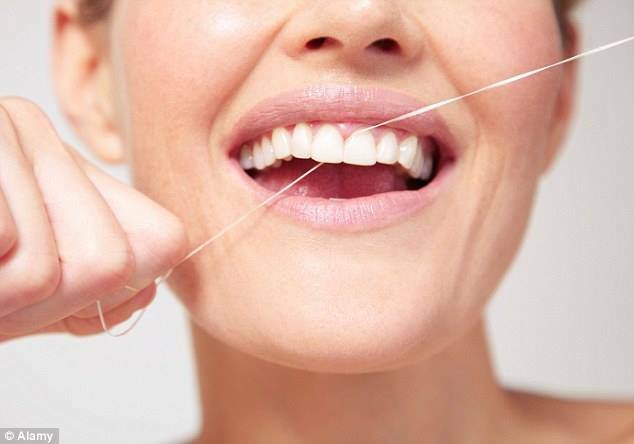 We know that loose bands, poking wires and other problems can occur with even the most careful and cooperative patients and we will work with you to accommodate your needs in every way we can. The American Association of Orthodontics recommends that a child first be seen by an orthodontist as early as age 7 or earlier should a parent or the family dentist discover a problem. The timing of orthodontic treatment is extremely important and greatly affects the treatment result. Since no two patients are alike, there is no absolute, specific age that is best to begin treatment. 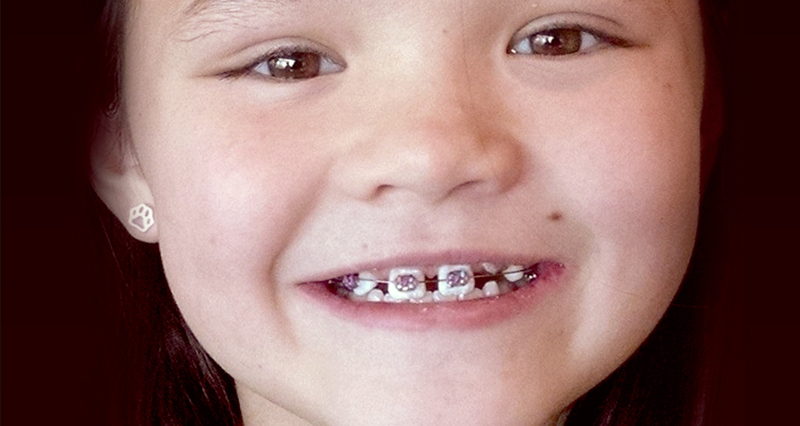 Many progressive treatments are now available for patients six to eleven years old that provide significant benefits, especially in jaw irregularities. These treatments may also prevent certain conditions from worsening. Treating children during their growth stages enables us to achieve results that may not be possible when the face and jaw bones have fully developed. 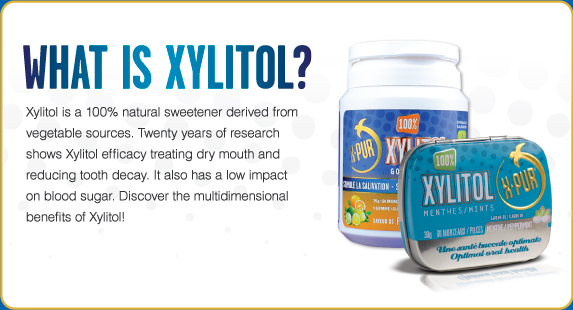 This early treatment can simplify or eliminate additional treatment. Early diagnosis and treatment by an orthodontic specialist can help guide facial growth and tooth eruption, thus preventing more serious problems from developing. Our goal is to reduce treatment time in full braces and to provide the best and most stable results possible. Your Child’s first Dental visit: What to Expect! The arrival of baby teeth is momentous because they allow children to graduate to a variety of new foods. In addition to celebrating this new stage in your baby’s development, you should also begin to think about a first visit to the dentist. Although parents of infants may not yet be concerned with dental care, the American Academy of Pediatric Dentistry recommends that the first dentist visit for children take place before a baby’s first birthday. Initially, dental visits are mostly informative in nature, but even at this early age, dental professionals help to establish a proper oral care routine that can last a lifetime. To find a dentist, check with your pediatrician or insurance company about providers in your area. Additionally, you may want to ask friends and family members for referrals. Narrow your search based on locations and office hours that fit best into your schedule. 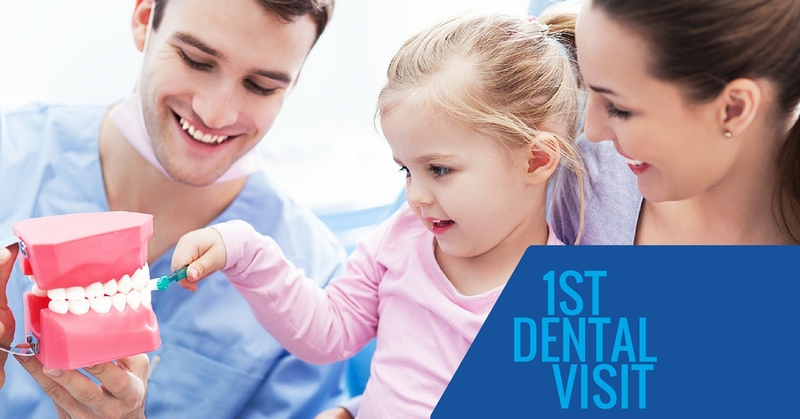 Try to interview several dental practices before selecting the one where you and your child feel most comfortable. In addition to calling for information, many dental practices also have websites with FAQs to help answer your questions. Ensure that your child is well rested and not hungry around the time of the appointment. It may be helpful to write down a list of questions ahead of time to ask the dentist. Very importantly, check with your dental insurance provider about copays and coverage before the day of your child’s first dentist visit. 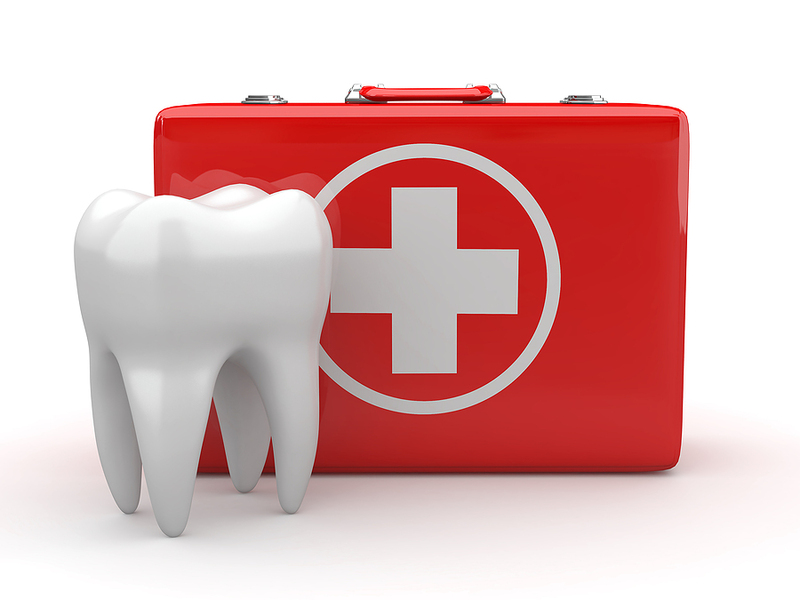 Most dental providers ask for proof of dental and medical insurance at time of service. Last, bring a list of your child’s current medications, and be prepared to fill out a health history form. By establishing a good working relationship with a childdentist, parents will ensure that their child receives proper dental care beginning at an early age. 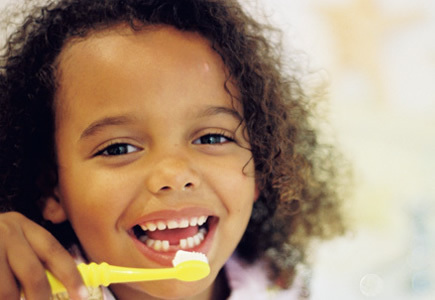 Setting a precedent for dental appointments at an early age helps children to become accustomed to a proper oral care routine. Patients have asked why this office puts an emphasis on cosmetic dentistry. The answer is easy. Cosmetic dentistry involves some of the more creative aspects of dentistry, rather than the simple, straightforward and routine mechanical side. There are so many things to evaluate when trying to remake someone’s smile. The challenge of figuring out the puzzle so that the patient will look their best is really intriguing and fun, and the results are highly satisfying. The finished product of a smile design is the result of a lot of work with excellent communication and cooperation between our dental office, the lab and the patient. Please call our office, if you would like to evaluate or discuss your smile. More and more these days, instant sorts of makeovers are shown on television shows and in the news. It seems that once a person makes the commitment to proceed, they want to get moving quickly. Our practice has noticed that too, and we are doing many more “makeovers” where we finish the entire treatment in a short period of time. It seems like many people just hit a point where they have “had it” with their smile or their appearance, and decide it’s time to look better. The next steps are important, because how happy a person is with the results, depends on how the treatment is approached and accomplished. • First of all, we interview the patient to determine their true desires, needs and wants. Everything starts with getting a good understanding of what the patient wants and expects. • We have to do a complete exam to understand the underlying health of the teeth, gum and bone, and how the bite, or occlusion, is working. • We take photographs, and impressions of the teeth for what we call study models. Sometimes we ask the dental lab to create the desired appearance in an ideal wax smile. It is a fun process. Once we know where we want to be at the finish, the process of getting there is usually just a couple of long and relaxed appointments. In the First Visit the teeth are prepared and impressions are taken; the patient leaves with plastic temporary restorations that are an actual preview of the desired end point. 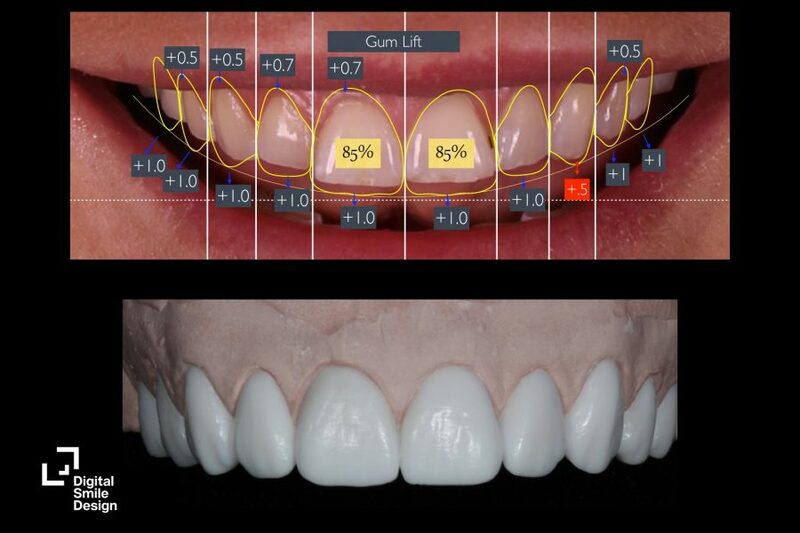 These provisional restorations allow us to personalize shape, size and color so that before the final porcelain restorations, we know that the patient is going to love their smile. This works really well, relieving much of the anxiety of someone not knowing how they will look. The patient generally receives the final restorations in the Second visit, where we take off the temporary crowns/veneers and try in the permanent ones. If they are fitting and looking like we want, these restorations are permanently bonded to the teeth. Subsequent visits are made as necessary for any follow up or adjustments.